This week has been a bit chilly, and I had a little cold, so it was perfect time for soup. I found a couple nice-sounding recipes in the Moosewood New Classics cookbook, and decided to try this one, mostly because I had everything on hand. It called for some white rice and potatoes, which thickened it a bit, and also for coconut milk, which is a favorite of mine. I did substitute onions for leeks, because I didn’t have leeks. This is definitely a soup I would make again. 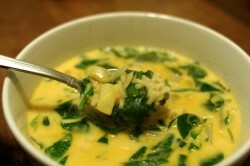 This entry was posted in cooking and tagged coconut, soup, spinach. Bookmark the permalink.